Power up your day without breaking your stride with healthy breakfasts that are neat enough to eat on the go. Super-easy to make. If your Paleo plan doesn't include ham, sub in the protein of your choice. "I LOVE these muffins," raves Brookside Bistro. "Great to reheat in the morning for a quick and healthy breakfast. And the possibilities are endless with this recipe." Loaded with oats, flax seeds, and nut butter. You can make these your breakfast or a post-workout recovery snack. "So good and good for you," says Hiedi Heaton. "This is a healthy take on the traditional no bake cookies. They are a hit with the kids and the adults, and always go quick! I store them in the freezer because I think they taste best frozen, but not necessary." All the pleasure of eating a cookie for breakfast, but with a lot less guilt. "Whole grains, fiber, protein, and no butter -- can it really be delicious? Yes!" exclaims IrisMac. ""My sister and I love something sweet with our coffee in the morning. We created this recipe to make a wholesome breakfast. I generally double the batch and keep them in the freezer. They taste even better frozen (still soft!)." Because no one should face morning meetings on an empty stomach. "These bars are great before a workout or when you need a quick snack to stave off hunger for a few hours," says Hungry in Vermont. "They are easy to make and do not need refrigeration." Fill up a travel cup to sip on the way in. "Perfect for people in a rush in the morning," says ASTROPHE. "You don't have to give up a good breakfast when it's this fast to make!" Discover more tasty combinations for your breakfast smoothie. 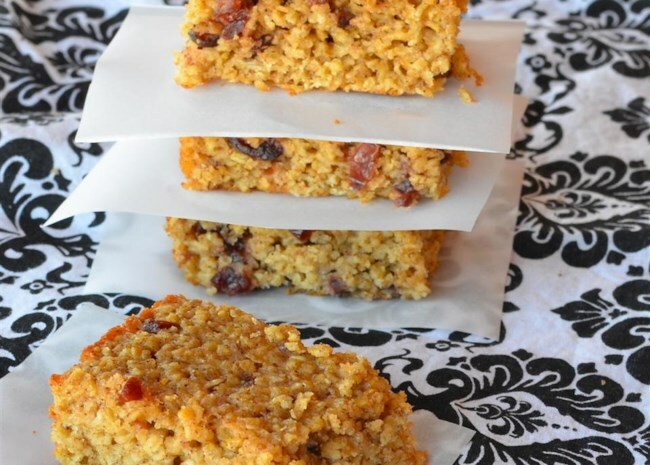 "Here's an on-the-go oatmeal bar without the artificial ingredients of commercial bars," says Nichole Tews. "This is the base for the bars, a recipe easily modified to suit your own tastes." Try adding almonds, walnuts, dried cranberries, chocolate chips, dried cherries, cacao powder, coconut, whatever floats your grab-and-go breakfast boat."